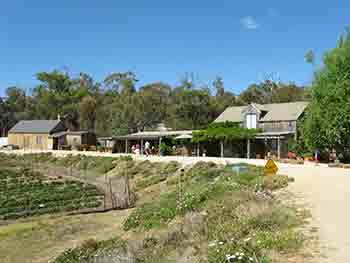 Kate’s berry farm offers sensational treats and magnificent views. - what a great idea! Going to Kate's Berry Farm was not part of the original plan. We were leaving Swansea (on Tasmania's east coast), when Greg (my husband) made the suggestion. We had seen a "Kate's Berry Farm" sign on the way in to Swansea. Why not stop there for morning tea, he asked. I must say I wasn't too thrilled with the idea as I was aware of our tight schedule and wanted to keep going. No regrets, let me tell you. Far from it. To start with, the views were magnificent. Well eventually we did enter the shop. And then there were important decisions to be made! What to have for morning tea? There were so many yummy treats on offer. I still recall the taste of what we finally decided on. I chose humbleberry with ice-cream. I had never even heard of humbleberry before, let alone tasted it. It was true to its name. It had a quiet but satisfying sweet flavour. Not over the top. Just the way I wanted my morning tea that day. Greg chose something we were more familiar with - raspberries with ice-cream. And it was sensational. As you can guess, we couldn't resist sampling each other's choice too. Greg got raspberry jam for us too. And we got some boysenberry jam for Greg's mum who is also fond of jams. Kate's Berry Farm impressed us tremendously. Such delightful tastes, such breath-taking views, yes it felt like heaven, or close to it. Back home, whenever I had some of that yummy jam, it just took me back to Tasmania and Kate's Berry Farm. When can I go again?!! The address is 12 Addison Street. 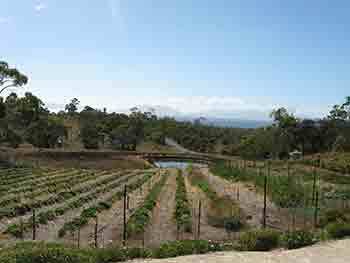 The farm is located just 2 km south of Swansea on the east coast of Tasmania.